We are excited to announce two UK concert dates with Brooklyn’s finest dhol ‘n’ brass band Red Baraat, produced by Asian Arts Agency. 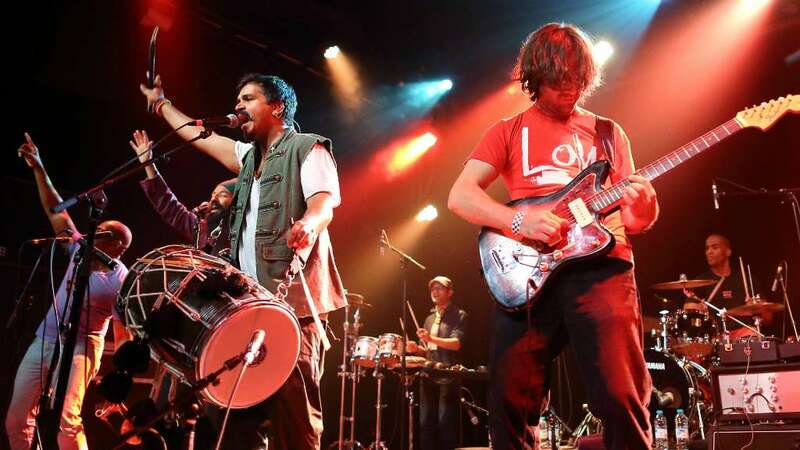 Red Baraat bring their seriously hot, larger-than-life live show to the UK in May for the first time since their electric WOMAD Festival appearance in 2015 and 2012’s debut UK tour (produced by Asian Arts Agency). Visit our Red Baraat concerts page for ticket info. Rightly described as “the best party band in years” by NPR Radio in the U.S, Red Baraat have developed a reputation for whipping any crowd into a joyous frenzy. They bring an unprecedented, high energy, gut-busting fusion of jazz, hip-hop beats, rock muscle, funky go-go, and scalding hot bhangra. Led by charismatic dhol drummer Sunny Jain, the group consists of drums, percussion, sousaphone, horn section and guitar. The group’s second studio album in 2013, Shruggy Ji, debuted at #1 on the Billboard World Music charts and propelled the band on a nonstop three-year world tour. The group’s most recent release ‘Bhangra Pirates’, in March 2017, features a key element that the first two album releases did not: guitarist Jonathan Goldberger, whose surreal textures and percussive playing is the ideal complement to Jain’s thunderous dhol. Fusing the infectious North Indian rhythms of bhangra with funk, Latin and jazz, Red Baraat have created and defined a sound that’s entirely their own. Big, brassy and full of energy, Red Baraat always bring the party to town. Presented by Asian Arts Agency with Rich Mix London and Colston Hall Bristol.